Potato which grows on a vine, rice that can be eaten raw after pouring water, cracked wheat (dalia) which is naturally sweet. All this may sound exotic but our farmers have been growing these crops for centuries. More than these, there are various crops which can help deal with specific health ailments and can be grown in adverse conditions. What would you say about a variety of red rice specifically cooked for pregnant women due to its nutritional values or paddy which can be grown in salt water of Sunderbans? The fact that we know little about them signifies the marginalisation of traditional seeds in wake of hybrid seeds pushed by private companies and hailed by policy makers. But more than the market, it impinges upon our right to choose what we grow and eat. Hybrid seeds have been largely developed with a focus on yield thus neglecting the nutritional qualities of a food crop. Traditionally, the seeds could be farm saved and shared among neighbours. They were rarely bought. But today, farmers can’t grow these ‘quality’ hybrid varieties as they are designed to give a good yield for just one generation. These have to be bought every year from the traders. As a result, farmers, who were the creators of seeds, have to now rely on the whims of private companies flashing the patent licences. More often than not, this results in costlier food on our dining table. The banner of intellectual property rights has no meaning when one considers that the hybridisation only involves adding new qualities to the previously available seeds which have been preserved and improved upon by farmers. Sabarmati, a farmer and seed saver from Odisha, feels promotion of a few hybrid seeds is monopolising the farming practice. “Farmers preserved the seeds not just because of the high yield but because of their properties like drought resistance, flood resistance, fragrance etc. Monopolisation of a few hybrid seeds reduces our choice to grow and eat the food we want,” she says. If hybrids signify the exclusive control and alien culture, traditional seed varieties denote the spirit of commons and local ethos. Saroj of Paschim Orissa Krishak Sangathan feels arrival of seeds alien to the land is firs t indicator of political changes bound to happen. “Seeds are related to our culture, health and social and national sovereignty. Once you lose seed sovereignty, you lose these rights as well. In south and western Orissa, migrants introduced corn in 1960s and slowly land ownership shifted from tribal hands to hands of migrants. The land which used to grow millets, pulses and oilseeds, all attuned to local needs, is now exporting corn,” he informs. Similarly, with introduction of hybrids we have lost our ethnic and political rights to corporates. “Unfortunately, the work of these corporates and government control was propagated by our own brother farmers and NGOs by using and promoting hybrid seeds during green revolution," Saroj adds. "What we eat is a political decision and unless we take these actions with awareness about indigenous varieties, we won’t be able to challenge the corporate control over our lives." Community-based organisations such as Sahaja Samrudha and Save Our Rice campaign, movements like Beej Bachao Andolan and various others have been preserving and promoting locally grown seeds. Besides, there are several individual farmers working with the same objective. Deepika Kundaji, a farmer from Auroville, has saved around 90 indigenous seeds of vegetables from various parts of India on a small 0.25 acre farm. “These are the varieties which are going extinct. You don’t find them in vegetable markets which is why it’s essential to preserve them. However, vegetables faces higher problem of cross pollination, which is why not many people work on vegetables,” she says. 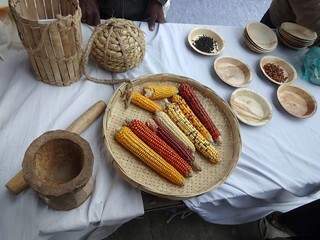 To deal with such technical challenges and to expand the circle of community sharing and preservation, an independent network of seed savers, Bharat Beej Swaraj Manch also called India Seed Sovereignty Alliance, was set up last year. The network will focus on unifying the efforts of individual seed savers and handle the issue of purity of seed varieties through capacity building workshops across the country. Sabarmati feels non-farmers can also contribute to these efforts by adopting certain indigenous seeds. “Even if you are living in a flat, certain plants like that of chillie can be grown in pots. Use them in your meals and also distribute the seeds further. This is not a difficult job and by sharing responsibility, we can end up preserving several millions of indigenous seeds,” she says.